Time for a rundown of my favorite books from 2016! This was a crappy year for lots of reasons (*cough* election *cough*), meaning it was an especially lovely year to hide in a book. Out of the eighty books I read this year, it’s probably not surprising that eight of my top ten picks are historical, since that’s my favorite genre, and nine out of ten are young adult, since that’s what I mostly read, but I’ve also got a couple of additional picks that really blew me away. 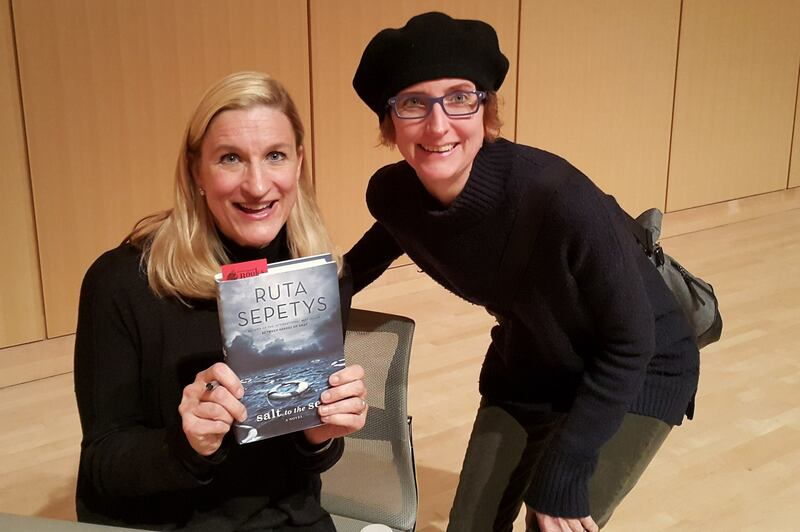 SALT TO THE SEA by Ruta Sepetys (YA historical). 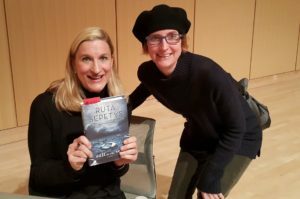 This one comes a photo of me with the author right after she signed my copy of her book. This WWII historical with multiple points of view is most definitely a must-read! OUT OF DARKNESS by Ashley Hope Pérez (YA historical). This book absolutely wrecked me (and I mean that in the most positive way). Anyone who knows me knows I love tragic reads, and this story about a 1937 school explosion in Texas couldn’t be more compelling. BURN BABY BURN by Meg Medina (YA historical). I wasn’t convinced this story would be for me, since it’s closer to present day (1977), but the details absolutely captured me in the time and place. I absolutely loved Nora and couldn’t turn pages fast enough as the summer of Sam heated up. OUTRUN THE MOON by Stacey Lee (YA historical). This story takes place in San Francisco in 1906, so the danger to Mercy Wong and everyone she holds dear is evident from the very beginning. Such lovely details and gorgeous writing! THE PASSION OF DOLSSA by Julie Berry (YA historical). This is one of the voice-iest historicals I’ve ever read, with multiple points of view sharing an amazingly well-researched story. AUDACITY by Melanie Crowder (YA historical in verse). Clara’s story as an immigrant at the turn of the last century grabbed me right from the start in this stunning verse novel. Such compelling images throughout! TO STAY ALIVE by Skila Brown (YA historical in verse). If you think you know the story of the Donner party, think again. Though I knew what was sure to happen in the end, I simply couldn’t put this book down. WHEN THE MOON WAS OURS by Anna-Marie McLemore (YA magical realism). This book is about a boy born as a girl and the girl reborn from the water who loves him, and it is absolutely magical. Each line of the story of Sam and Miel’s romance sings. GEORGIA PEACHES AND OTHER FORBIDDEN FRUIT by Jaye Robin Brown (YA contemporary). Even if you don’t read a lot of contemporary, do yourself a favor and pick up this lovely story about a queer teen who has to hide who she is as she navigates faith, friendship, and romance. THE GUSTAV SONATA by Rose Tremain (Adult historical). One of the reasons I loved this book is because of its similarities to Thomas Mann’s THE MAGIC MOUNTAIN, but I also adored the glimpse into post-WWII Switzerland, along with the very fine line between deep friendship and true love. As a bonus, I was lucky enough to read an ARC of THE GENTLEMAN’S GUIDE TO VICE AND VIRTUE (YA historical by Mackenzie Lee), and I simply cannot recommend this book enough! It releases in June, 2017, so get it on your radar now! So … what were your favorites? Any great historicals I missed? I don’t catch as many historicals, but I can always count on you to point me in the right direction. If they’re going to make me cry, though … Now I need to get on my favorite reads post!